No, the cost of the Dearborn improvements isn't $1.2 million, but rather a fraction of that. Update 9/18/18: After the publication of this Streetsblog post, CBS ran a correction of their segment, including new voiceover and graphics, removing the inaccurate claim that the Dearborn project alone is costing $1.2 million or $1,500 per evening rush-hour bike trip. Anti-bike screeds in the local media were common a few years ago, so it’s an encouraging sign that it’s been a while since I’ve had to write a post debunking one. 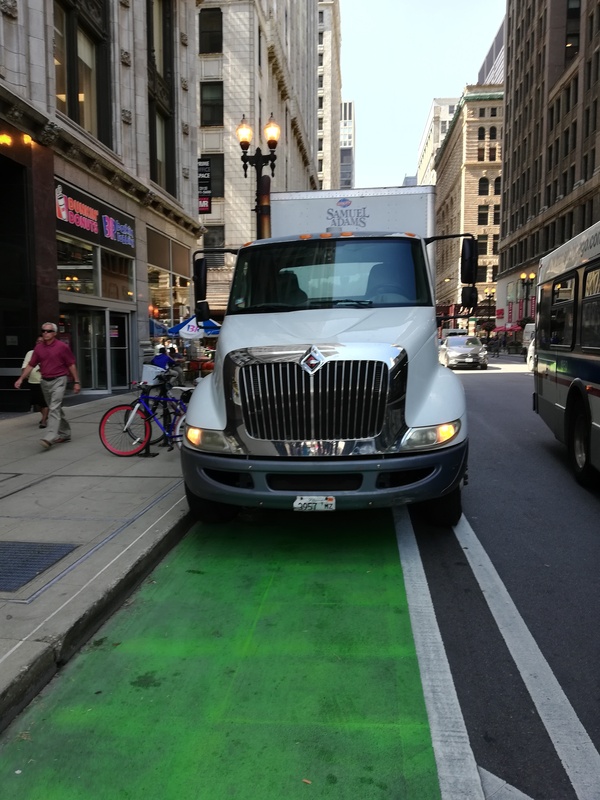 As transportation cycling has become more mainstream in Chicago, more residents and media figures alike understand that bike infrastructure is a smart investment in reducing crashes, calming traffic, and fighting congestion and pollution. However, there are still signs that not everyone has gotten the message. “The city says [the Dearborn project] is increasing bike safety,” says CBS reporter Derrick Blakly in the segment. “But even some cyclists aren’t so sure.” Those “cyclists” turn out to be one random guy on a bike who says he doesn’t feel endangered by drivers under the current bike lane set-up, with cyclists separated from moving traffic by the parking lane and flexible plastic posts. “Do you think it’s a waste of money?” Blakly prompts. “I think it’s probably just more concrete in the city, honestly,” the cyclist responds. Granted, the Dearborn lanes are already functioning pretty well. But it’s not unusual to see motorists driving or standing in them, and I’ve even heard a report of a fire department employee racing down the lane in an SUV to get around a traffic jam, an incredibly dangerous move. Having solid curbs, rather than posts that are easy to drive through, should help reduce these incursions, as Active Transportation Alliance advocacy director Jim Merrell points out later in the segment. “But the cost isn’t cheap,” Blakly counters. 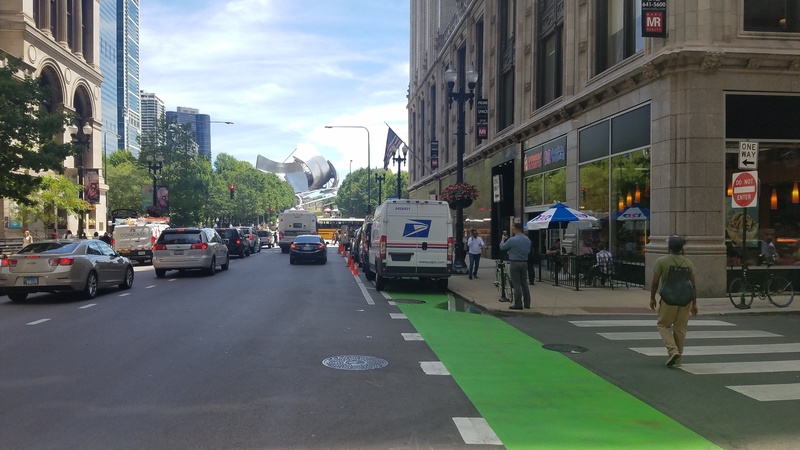 “The Dearborn bike lane upgrade… costs almost $1.2 million.” He notes that the Chicago Department of Transportation says the bike lane sees about 800 cyclists during the evening rush, from 4-6 p.m. “That comes to $1,500 per cyclist… That’s a pretty high cost.” He acknowledges that the funding is coming from federal Congestion Mitigation and Air Quality Improvement grants. “But ultimately those federal tax dollars are your tax dollars as well,” he concludes, fanning the flames of driver resentment. First of all, it’s pretty absurd to judge the value of a project by dividing its cost by the number of people using the facility during two hours of the day. But if we’re going to play that game, the Jayne Byrne Interchange expansion project in the West Loop is costing $600 million for a facility that sees about 300,000 motor vehicle trips per day. That comes out to $2,000 per trip for the entire day. Under an apples-to-apples comparison, looking only at the number of vehicle trips during the p.m. rush, the interchange expansion’s cost-per-trip would be several times higher than that of the Dearborn improvement – that is, if Blakly’s figures on the Dearborn cost were accurate. However, they aren’t. According to CDOT spokesman Mike Claffey, the $1.2 million cost number the department gave CBS isn’t just for Dearborn, but for a whole slew of bike lane projects. These include concrete curb improvements to existing protected bike lanes on Milwaukee and Elston in West Town, which are nearly completed; buffered bike lanes on Washington Boulevard in Garfield Park, which are completed; and upcoming curbs on the Harrison protected lanes in the South Loop, slated for 2019 construction. While Claffey didn’t provide the exact price tag for the Dearborn project, it’s clearly only a fraction of the $1.2 million figure CBS reported. So that means that the cost per evening rush-hour bike trip is a fraction of the $1,500 number Blakly stated. That, in turn means that the price-per-trip of the interchange expansion is exponentially higher than that of the bikeway upgrade. So which project has “a pretty high cost”? In fairness, all reporters, including yours truly, make errors from time to time, but when we do, a correction is warranted. Claffey says that CDOT told CBS before the report came out that the $1.2 figure was for a bundle of bike improvements, not just Dearborn, and the department has requested that the network correct the misinformation in the segment. Therefore, CBS really ought to run a follow-up spot retracting Blakly’s implication that this sensible safety upgrade is a waste of money. There are some valid criticisms of the spending priorities here that get lost when an article like the CBS piece puts cycling advocates on the defensive and forces them to defend less than ideal plans. 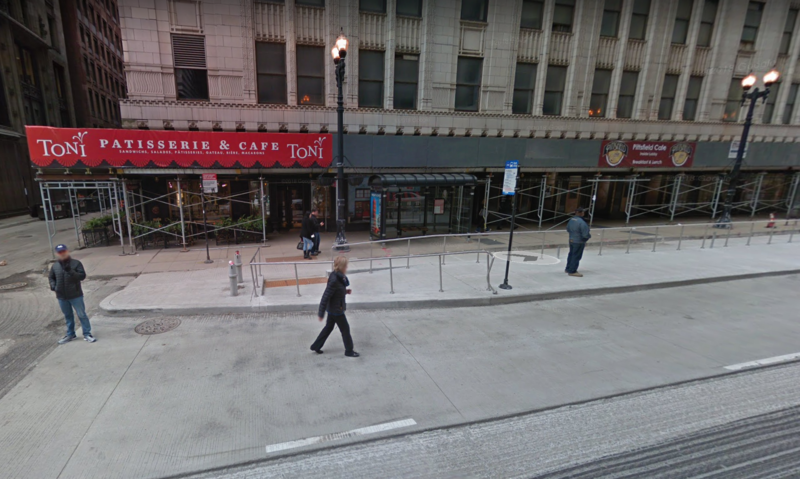 Even confining options to potential projects on Dearborn, installing curbs is a low priority project. The biggest problem with Dearborn is the pavement quality, which this does nothing to address. Additionally, as most cars enter the lane at driveways, the curbs are unlikely to solve the problem of cabs and rideshares using the lane as a loading zone. The curbs may even make this problem worse by fencing cyclists in and making it harder to go around a car blocking the lane. Emergency vehicles being able to use these lanes to get around traffic is a benefit and can be a powerful counter to people who complain about emergency response time when talking about PBLs. It’s much easier for cyclists to get out of the way than big metal boxes. Obviously, they should only be used with caution, during an emergency response, and with lights and sirens activated. Not to mention once you’re north of Kinzie, Dearborn is basically a free for all. There are so many more beneficial projects right in that area that could have funded instead. We should be past the point where we celebrate everytime CDOT does something for bikes, and start insisting on good projects and smart priorities. Agreed, as mentioned in an earlier post the dozens of roughly two-inch-deep manhole cover divots in the blocks near Daley Plaza are a major safety hazard. Yes, I am aware. Clarified my post for those who might not have ridden the stretch. Great update. I’m sure Kass will weigh in on it within the next week or say and say something silly. I see that a lot. Same with the section west of State. I think this is a good point Cameron. I feel a little claustrophobic on the new Elston/Milwaukee curbed lanes. You can get pinched at driveways and streets with no left access. I also wonder when the streets need a repaving, will the city leave the bike lanes as is? There are many areas on the new Elston/Milwaukee curbed stretch that need paving now. Bikes are forced to drive thru crap pavement as opposed to accessing empty parking spots on the left that might be smother. ^This for the Clybourn PBLs, especially on the Westbound portion on Division. They put in the curbs but never fixed the terrible pavement.